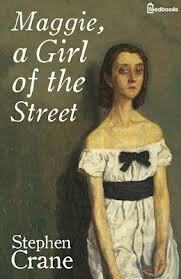 Naturalism in Maggie, Girl of the Streets is one research papers topic on Steven Crane's works. Both Sister Carrie and Maggie: A Girl of the Streets discuss the figure of women in urban settings. Formulate a comparative essay discussing the two authors perspectives on the female subject. What were some difficulties women faced during this era? What were the obstacles society placed on women advancement and what were societies expectations? Describe the novels' literary movements and provide evidence? Naturalism emphasized biological and/or sociological determinism and viewed the behavior of people as being conditioned by forces outside their control. There is a kind of naturalist manifesto in the description of Jimmie’s development near the beginning of chapter four. The naturalist prides himself on facing this unpalatable truth. There were two types of literary naturalist—the one oriented towards a biological survival model for human behavior, the other oriented towards a social forces model for human behavior. Crane was mainly of the latter type, but this passage shows him to have had room for the former as well. The economic and social forces at work cannot be resisted. Maggie is doomed because she has no free will. Her fate is determined, solely determined, by overwhelming forces beyond her control. This is the social forces model of naturalism appearing in Crane’s story. One of the social forces that ruins Maggie causes her to be infatuated with Pete. She is a creature of Rum Alley and therefore has no opportunity to acquire any sophistication about the world. No amount of struggle on her part can prevail against the evil world that surrounds her because that same world has rendered her incapable of knowing what it is she should be struggling against. “The girl, Maggie, blossomed in a mud puddle… None of the dirt of Rum Alley seemed to be in her veins.” But it soon gets in her veins. The economic and social forces at work cannot be resisted. Maggie is doomed because she has no free will. Her fate is determined, solely determined, by overwhelming forces beyond her control. This is the social forces model of naturalism appearing in Crane’s story. One of the social forces that ruins Maggie causes her to be infatuated with Pete. She is a creature of Rum Alley and therefore has no opportunity to acquire any sophistication about the world. “To her the earth was composed of insults and hardships. She felt instant admiration for a man who openly defied it.” She is too parochial to see Pete for the destructive low life that he really is. This is part of a very deterministic view of life in the world. The naturalist sees a Maggie as being without a chance in life. No amount of struggle on her part can prevail against the evil world that surrounds her because that same world has rendered her incapable of knowing what it is she should be struggling against. Women in Society custom papers look into the role women play in society and how it is constantly changing and evolving. The Open Boat - Stephen Crane's short story “The Open Boat”, is a story about four men stranded in the ocean on a small boat. Symbolism in The Red Badge of Courage - Symbolism in Red Badge of Courage research papers examine Stephen Crane's use of symbolic writing. Blue Hotel research papers examine one of Stephan Crane's most disturbing short stories. The Red Badge of Courage research papers focus on the themes of Stephen Crane's novel and the main character Henry. A Bride Comes to Yellow Sky research papers examine the Old West as viewed by Stephen Crane in his works. Paper Masters writes custom research papers on Naturalism in Maggie, Girl of the Streets and on Steven Crane's works.